Play along with a lively Irish session, a spirited Ukrainian hopak, a tantalizing Arabic belly dance, a famous Italian tarantella, a joyous Klezmer hora, and over 50 other international favorites! This definitive book/CD sampler features vibrant folk music from North America, the British Isles, Western and Eastern Europe, and the Middle East. 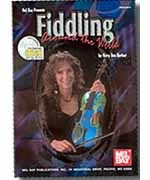 The text combines clear explanations of authentic ornaments, bowings, and rhythms with fun tunes which are comfortable and easy to learn. The music includes chord symbols and some twin fiddling harmonies. The book also includes a helpful 'Quick Reference Key and Glossary' of musical symbols and terms, as well as performance notes for each of the 58 songs. The included compact disc provides accompaniment for all of the tunes. By the author of bestseller Gypsy Violin, this outstanding intermediate-level collection is a must for handling assorted ethnic requests, or exploring ethnic styles.